and customized workflows to to help clients win. The ultimate success of any e-discovery effort can depend on whether the data has been processed properly. Any problems that occur during processing can amplify issues that occur downstream in the e-discovery lifecycle. Clients run the risk of a missed court deadline, or even a judicially ordered adverse inference or a sanction, if data is erroneously omitted and later identified. We offer clients a more agile, secure and reliable solution for efficient processing and hosting of data. By making the raw data more useful, searchable and analyzable earlier in the lifecycle, we can help clients save costs and avoid penalties. Our experts can help bring order to the chaos of your raw and undifferentiated data by helping you penetrate the dense veil of technologies and data formats to identify and extract information and metadata, with customizable levels of de-duplication. From text messages to cloud-based software to social media, we can deliver transparent reporting that enables you to audit all of your data – all of the time. Precision Discovery’s Multi-Matter Solution turns the current discovery model on its head by single-sourcing data for matters where a single data set is the source of records in multiple cases (Corporate Officers and Directors, etc.). Our Corporate Repository provides instant insight and early case assessment that allows counsel to spin-off litigation-specific review databases in as little as 24-hours while saving processing costs of up to 30% per project and maintaining valuable historical work-product. We offer a “Best in Service – Orange” e-discovery experience using kCura’s Relativity platform, the most widely-used e-discovery software. Not all Relativity providers are equal. Our clients have an exceptional user experience that is directly tied to our superior infrastructure and customer service. Whether you are dealing with very large matters or massive files, our Relativity experience is better, more responsive, and more robust with a 99.999% uptime. Our Relativity certified consultants can provide power-user Relativity support directly to you when you need it, avoiding costly delays. Precision provides eDiscovery data processing through iPro processing software. 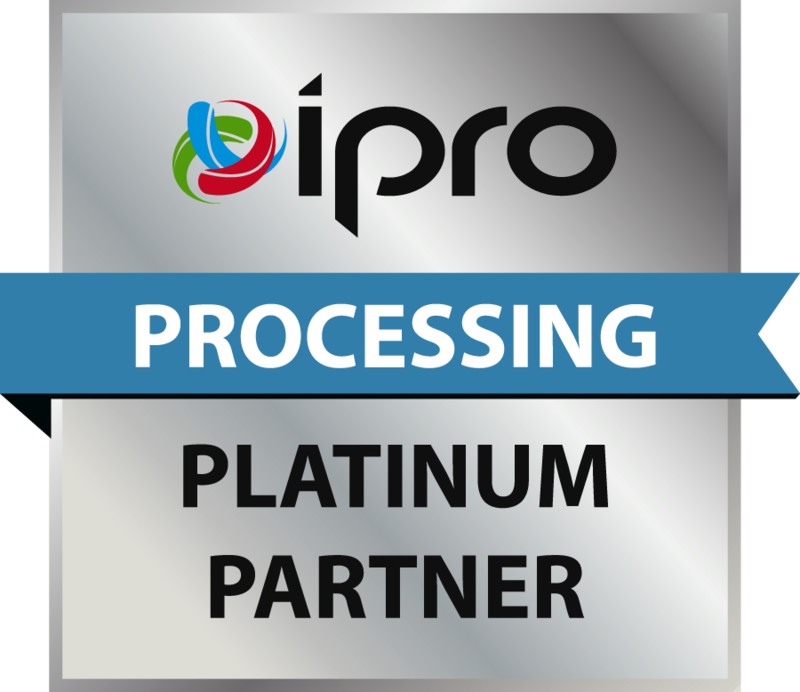 Precision has attained iPro Platinum Partner status. This means that Precision meets and maintains rigourous infrastructure and training certifications. Precision provides data analytics through NexLP. There are many eDiscovery analytics technologies available but not all are the same. With Precision and NexLP, our clients gain the benefit of a true AI platform that is able to analyze not only the text of a document but many different features within the data.